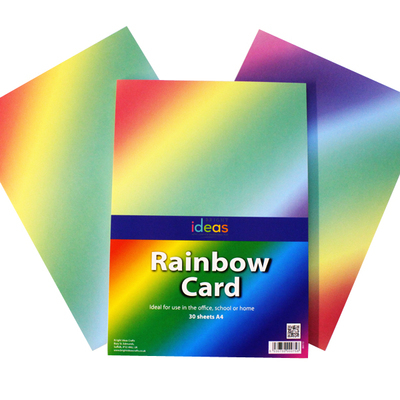 Kick off your next crafting session with this bold A4 Rainbow Card Pack. Guaranteed to make their creative minds go into overdrive, these A4 sheets of 200 gsm card are suitable for everything from embossing, punching or cutting through to use with inks and paints. Each sheet has a slanted rainbow design which sees bold colours blending into each other - exactly like the eye-catching tones of a rainbow. A great resource for busy nurseries, classrooms or offices, each high-quality sheet in this card pack is sure to lend itself to exceptional crafts. We also stock these colourful rainbow sheets in a paper format and a crepe paper design to suit all your crafting needs.